The wild Thames, lonely greenlands, history, a breathtaking bridge and industrial change between Greenhithe and Northfleet. 6.4miles, 10.2km2.5 hours. Firm underfoot in most conditions except for one point between points 5 and 6. A walk of fascination and contrasts with some amazing features. This is Kent, but not the garden of England This is a walk through the edge lands, where everything is in a state of flux, where the normal rules do not apply and the land is constantly under threat of being overwhelmed by the river or the Thames Gateway project to warehouse the poor, or both; where human endeavours, great and marginal, crop up quickly, flourish and decay, leaving only remains; where the desolate heathland, which once covered much of England, still remains. This is the wild, wide, working Thames, frightening in its potential power. 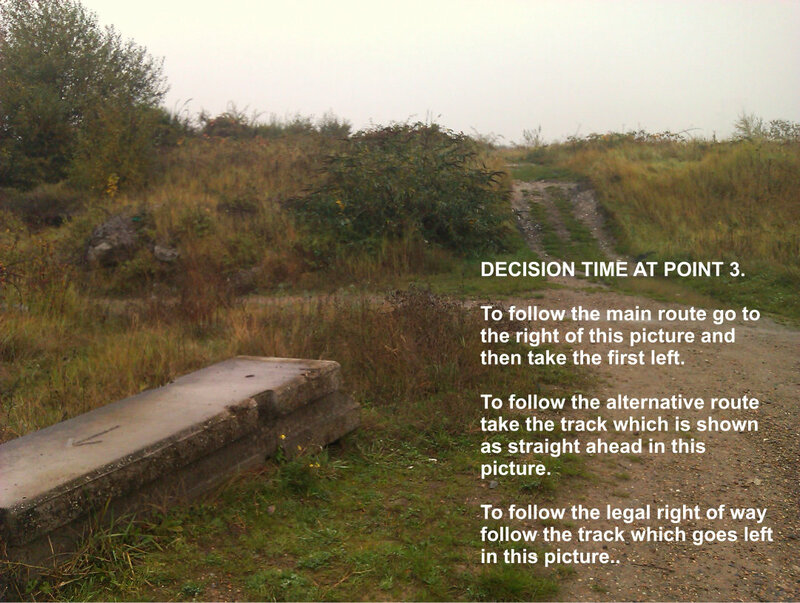 Some of the walk is currently proposed as the site of a theme park but nothing is likely to happen much before 2015, if ever. This can be a lonely walk. Enjoy this if you like it. Take a friend if not. Start Greenhithe Station TQ585748 Finish at Gravesend Station TQ645740. Alternative start or finish point Northfleet Station TQ615744. This one of series of walks form a link between the Thames path, which is now extended to the mouth of the Darent, and the Saxon Shore Way, which starts at the end of this walk. Possibly at Greenhithe station (not always open), Gravesend in the shopping mall and at the tourist office. 1)Start at Greenhithe station by turning left as you come out of the station. Walk down to a roundabout and turn right here, heading north. Pass the Asda supermarket on your left. Call in for coffee an food if you want. The main route then turns right along Greenhithe High Street. There are various points at which you can cut through to the Thames, but the High Street is probably more interesting. The centre of Greenhithe is surrounded by ever increasing new housing, (most on the flood plain), but the centre still has the atmosphere of a village and there are some very beautiful buildings. There are two pubs, which stay open all day. The first has a garden with river views. 2)At the end of the high street turn left through a gate which takes you to the river. The walk route takes the lower path here. You may want to make a diversion to the right through the massive Ingress Park estate to visit Ingress Abbey and look at the development. Who lives here? What do they think of it? Note that you can only gain access to the route here or at the far end of the development. Otherwise walk along the river bank to the end of the development. ( Take the lower path to the left, beside the river. Follow this for about 600 metres until you come to a 3 way footpath sign. At this point climb onto the bank to your right and continue in the direction that you have been travelling. 3)Shortly afterwards your way along the bank is blocked by scrub. Descend to a rough road on your right at a point at which it does a U turn. You will see a concrete slab with an arrow pointing to the river. You may want to sit on this and consider your options. Different editions of the maps show different layouts here, so yours may not be entirely accurate. In this wild spot it is strange to think that you are almost directly above the High Speed 1 main line. To follow the main route follow the U bend round to the right and THEN take the first track on the left after about 10 metres. It is quite a clear track. Follow this track, bearing right at any forks (but do not take a signposted path which goes off at 90 degrees to the right). You will start to find wayposts which show the way. Bear right at point (4), where a track comes in under the overhead electricity wires. To follow the alternative route it is possible to follow the right of way shown on the ordnance survey map from point 3 but it is better to walk straight ahead (see the picture) heading towards the huge pylon. I’m not usually a fan of pylons but this is something else. It, and its brother across the river, are apparently the tallest pylons in Britain, and the second tallest in Europe. It is like a huge sculpture. Walk under the pylon and then ahead in the direction you have been following. The path turns right, following the water and you see an amazing collection of boats and individual shanty constructions. At a fork bear slightly right on a track, away from the boats, and meet a track which heads right, to the south. (As a further alternative on a clear day you could head north here to explore the wild salt marsh further, returning perhaps to points 5 or 6. This is a smashing area to explore if you are confident of your map reading). Under the electric wires you meet the main route and turn left at point 5. It is strange to think that this lonely spot will, if the developers have their way, be at the heart of a theme park. At point 5 turn east , following the waymarks. The track turns into a path and then turns right and joins a track coming in from the left (6). Keep straight ahead on the track until you come to an unlikely football pitch. The changing rooms are in a portacabin. It must be quite an experience to play football here. 7)Turn left up the rough steps the club have built up a mound. At the top of the mound duck under the scaffolding to the right and walk along the mound, which runs parallel with the industrial estate road. There are a considerable variety of mushrooms on the path here in autumn. Where the path descends from the mound continue down the main industrial estate road to the junction with the main London road. Notice on your right a large collection of London Transport routemaster and other buses, nearly all in good condition and obviously still used. At the main road go south east (slightly left) past the Ebbsfleet football club ground. There have been a number of cases of famous football clubs getting the name of their local station changed, but so far as I know this is the only example of a club changing its name to that of a railway station. The club used to be called Gravesend and Northfleet but changed its name when nearby Ebbsfleet International station was opened. On your right is a small section of woodland. There are still dead Elms here from the Dutch Elm disease outbreak. The wood has been left to go wild. Continue following the road without going down any turnings, as it bends round to the right. On your left you will see Northfleet Harbour, a site of considerable interest to industrial archeologists. There are some surprising things to see on this industrial estate. Where else do you see an abacus in a security gate? 9)At the end of the road a footpath leads ahead. Follow this and quickly come to a junction. For now turn right. The path climbs gently and emerges at a road. Keep straight ahead here to the main road. Cross the main road and turn left. This is Northfleet High Street This looks slightly run down now, but is full of history. Continue for about 300 metres. Pass Council Avenue on your right and come to a point where the buildings end. 10)Look out for a signed footpath on your right, which leads to the church. Take this path past the church on your left. Note the ancient outside steps to the bell tower. 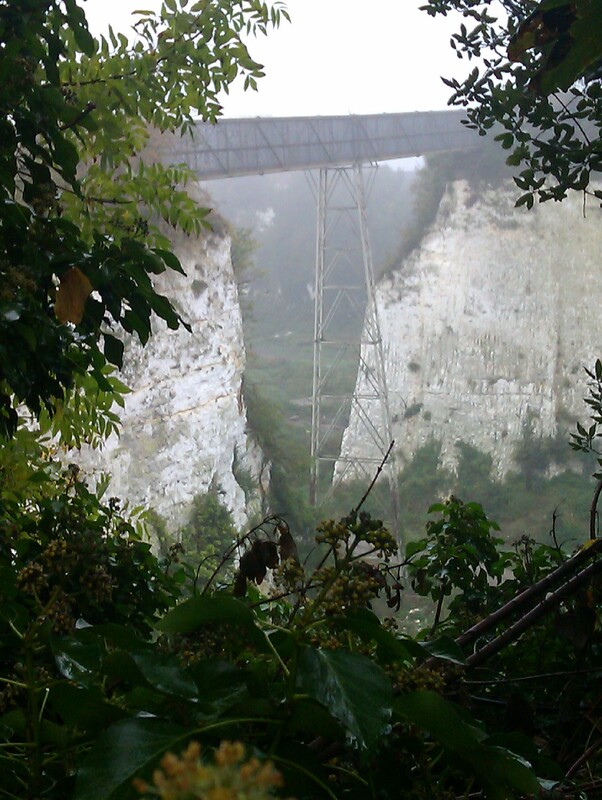 Have a look on your right to see the most amazing site- a bridge over a huge chalk chasm. At a path junction turn right on to walk out onto the bridge. Walk as far as you like and then return. 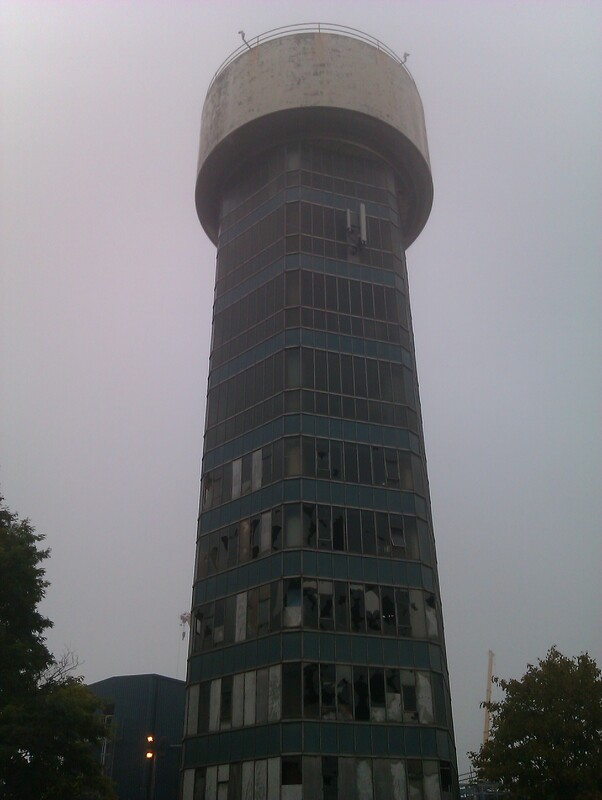 Sadly, you are so encased in security wire that the view is obscured, but the panorama is still amazing. Notice how the bridge bounces a little as you walk over it. Old chalk pits with vertical sides and considerable depth are a feature of this area. Often the right of way is maintained by leaving the path with cliffs on either side. Here it has been quarried away altogether and replaced by a bridge. On your return walk back towards the church and take a path into the churchyard, which will now be on the right. This is the 14th century St Botolph’s church. 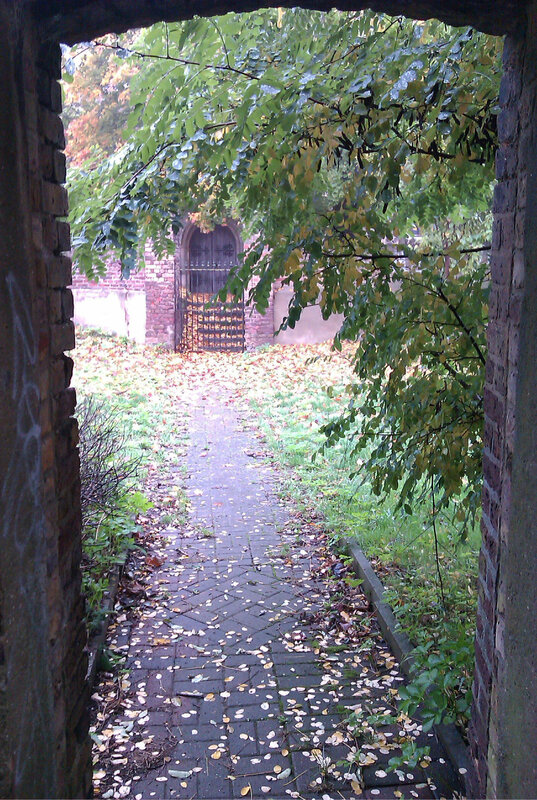 It is normally locked, but the churchyard could be a good place to eat your sandwiches. On the horizon you can see the rival Catholic church, which was designed by Giles Gilbert Scott, the designer of Liverpool Catholic Cathedral. The church at Northfleet foreshadows the design at Liverpool. Walk along the path through the churchyard to the Lych gate. 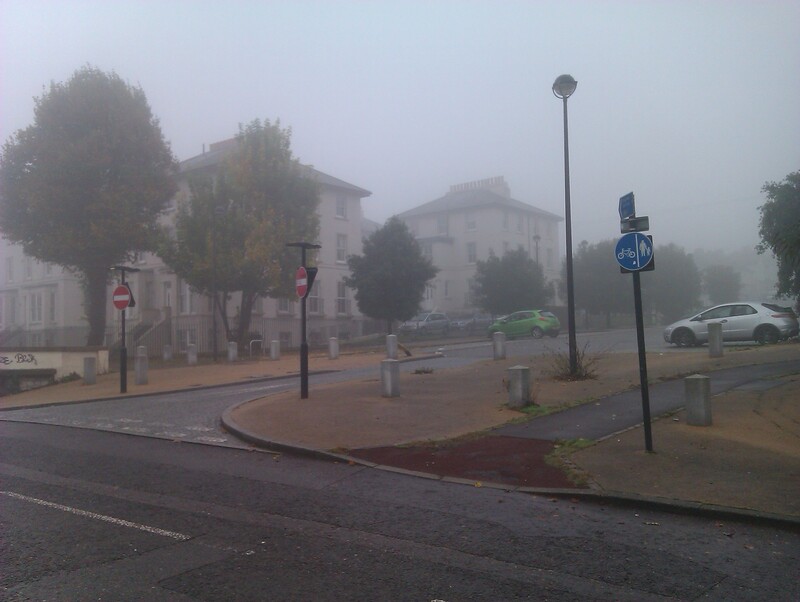 Walk through this to come out in the attractive Northfleet village square. This area is known as the Hill. As any village should, it has a pub and a café. Cross the main road and turn left past the café. Continue for about 50 metres. On your left you will see a pair of Victorian houses called Granby Place. On your right is a road with a white metal gate barring cars. Walk down this road, which turns into a path with views of a factory in a chalk pit on the right. On your left, if it has not been demolished, you will see a curious tall derelict building This was once a water tank with offices underneath. The workers must have experienced some funny noises as the water went up and down. Continue along Crete Hall Road, passing straight ahead at a roundabout. The road kinks slightly to the left and then there is a turning to the right. Keep straight ahead again, but shortly afterwards find a small footpath to the left, sandwiched between two high fences. 13) Notice some plaques on a gate by your left and some rather grand houses on your right. You are now in Rosherville. In the 19th Century pleasure gardens were laid out here and grand houses built. The gardens are gone but some of the houses remain, looking rather odd in such an industrial landscape. From here to point 14 you may dodge about a bit. Keep as near to the river as you can. The road starts to bend away to your right, but a smaller road turns to the left. Follow this. Notice the White House on your left. This is an historic, though unlisted building, with plaques commemorating Lord Northcliffe- missing in August 2016, but possibly due for replacement. The route kinks slightly to the left and becomes a path by the riverside. This emerges at a roundabout. Turn left and follow the road straight into Gravesend (going straight ahead at a second roundabout.) until you come to the Pier. In August 2016 there was an establishment called the Mug and Meeple on the corner, a former pub. 14)Turn left here to see the Pier. Although a restaurant has been built on it, you can still enter on the right hand side and walk towards the end of the pier. The land end of the pier is the start of both the Saxon Shore Way and the Wealdway. To get to the station you head inland from the pier up the High Street, with its historic buildings and market. Cross a busy shopping street and then turn right at Manor Road, just before you cross the railway. Keep straight ahead at the next junction to find the railway station.